It’s the second book from Francesca’s #BloggersBookclub, you can see the first book from the club over here! The Abomination is set in two versions of Venice. It’s real life cobbled streets, expansive waterways and darkened corners, and it’s online virtual mirror image counterpart; Carnivia. This cyber-side to the novel was what really intrigued, after all I can’t say I actively read a lot of crime novels. Carnivia is the brain child of the once kidnapped and mutilated Daniele Barbo, a computer whiz kid who is going on trial for not allowing the government access to the online lives of his websites users. You can actually log onto the Carnivia website, choose a mask to hide behind and confess your sins – it was actually pretty fun to read some of the things people had wrote, something we see happen in the book too. It’s an interesting way to enhance the act of reading the book and a twist on what we usually find on a books corresponding website. The books key players are Carabinieri captain Kat Tapo and American intelligence officer, Second Lieutenant Holly Boland. Both women are incredibly strong willed and independent but they have their own scars and flaws making them somewhat more likable characters, especially Kat. It took me a long time to warm to her and see beyond that hardened exterior. The book explored the problems women face in male dominated careers, hell, the majority of the book was pretty much about women being over powered and dominated in some of the most disrespectful and exploitive ways you could imagine. This is not a book to go into so lightly and I wished I’d have known before hand just how disturbing some parts of it would be – it was no bedtime reading that’s for sure! The women are thrown together when a murder investigation and an investigation into human trafficking and conspiracy theories start running along the same paths. Insert murder, politics, violence, prostitution, computer hacking, bomb drops, war crimes and car chases. No, I wasn’t expecting all of that and then some either! In a way, it felt like I was reading two books at once and though they intertwined at points, just as I was sinking my teeth into one book it took off into the other. Overall, I was impressed, it was a decent but heavy read. The darker sides to the novel took my off guard so just bare that in mind if you pick this one up. And I recommend you do. If like me, you don’t read many crime novels then this is a great place to start. It pretty much covers everything and anything I would expect to find in a crime novel. As a women, I found the constant hammering home about women being taken advantage of by men in both a mental and physical way to be a bit too much at times but as one of the main arcs of the story I can accept the point had to be made. If that’s something you’re not really comfortable reading though then this isn’t the book for you. I know I needed something I little more lighthearted after this one that’s for sure! 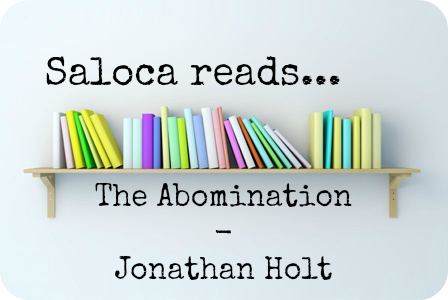 Have you read The Abomination by Jonathan Holt? Any recommendations for that I should read next? Let me know in the comments below! This sounds interesting. Online virtual mirror image counterpart. Now that sounds like something I'd like! Pity I hardly have time to read. Woe. There's always time to read! It's about the only thing I enjoy about my morning commute! I was surprised by how much I enjoyed it, I'm not a big crime novel fan myself!